And by Warlight, I don't mean the game that most people on this site play! In fact, Tabby's got even less points than I do, and I'm a ghost! I'm commenting on the fact that, in the words of Karl, Tabby has literally written a book worth of his ideology on this forum, had most of it deleted, and still had the balls to continue posting, despite all of his lost content! Now, let's analyse Tabby as a person. Firstly, we have an infographic about his posts. Now, the yellow is gargantuan. He posts an average of over 5 times a week, which is truly insane! He really puts the "rat" in "rational", if you know what I mean. 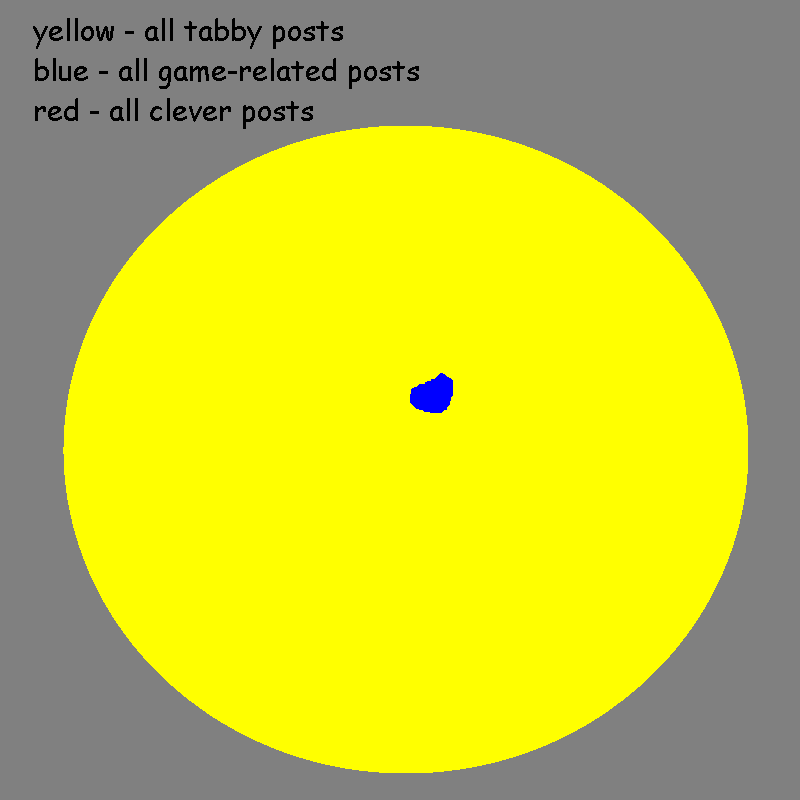 Secondly, observe the blue. He used to post about WL! Anyone remember WASTELAND STYLE? Sadly that never even got into RPCL, and that got Texas 2ag2! Finally, notice how there is no red. We can't all be winners. Let's observe what goes on inside Tabby's head. We see the typical posts: Peafowls, autism, Islamism, Asexuality, Detroit, etc., but let's look at a couple of specific ones, eh? 2) Tabby really wants to leave WL, but he simply can't. He's made 3 threads about leaving the site, but his addiction keeps pulling him back. 3) Tabby likes music! Sadly, he only likes authoritarian regime music :( I'm not able to share my remixes of Shredtail's bops to him. So, what have we learnt today? - Tabby needs a mate! If you can find anybody more racist, please contact me and I'll make sure this person can find Tabby, I've already got our Aspie friend's address, so I can just direct him there for a sleepover. 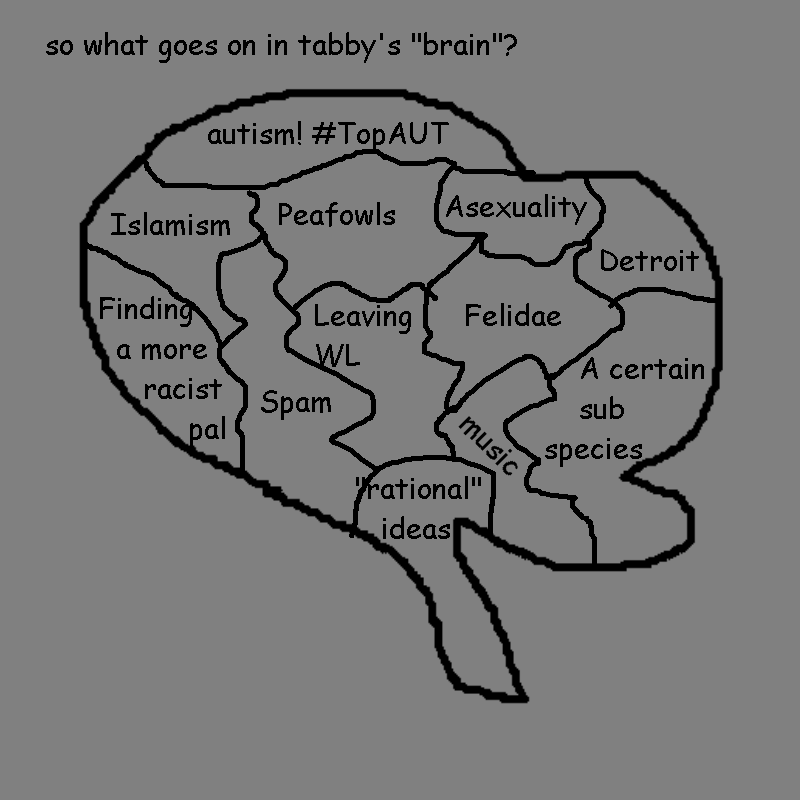 OxTheNeurotypical needs to learn autism. these forums are a wasteland. tabby is just a crazy cat lady. No one who has posted on this thread has the account name 'OxTheNeurotypical', so I'm unable to read that post. You should make an effort of leaving the forums like you have announced to in various threads such as https://www.warlight.net/Forum/271105-good-bye-forum. You sould do what you say you will to gain people's trust and potentially become more popular. Um, you were talking about "OxTheNeurotypical, not "OxTheAutist". Those names are opposites; who are you talking about? 4) What sub-species do you think occupies a large amount of Tabby's brain? Can you quote the line? He was talking about sub-species of parasites the one time he mentions the word "sub-species". Africans are a subspecies of human. NOTE - "SUB" does not imply "inferior." "Subspecies" is used in everyday biology to describe different genetic populations of the same species. Funny how so-called "anti-racists" claim to support science. Or they'll respond with some kind of moral argument. LOL, morality does not change reality. I don't see how pointing out genetic differences among populations is inherently evil. It's the truth. ^Tabby you are Magneto from X-Men. Not exactly but kind of.